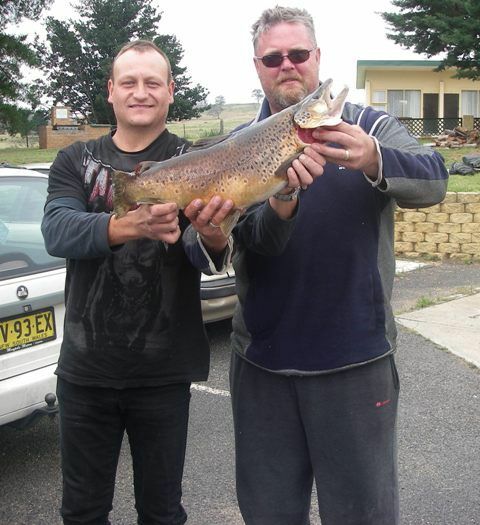 Season Greetings to all and the New year is looking great for the Ecumbene angler. So far over the last week we have had several reports on Eucumbene with some trophy fish been taken over the last few days regardless of the weather.The fish are in great condition as the lake is full of food with the rising water flooding the banks and the fish are loving it. Two keen anglers Sammy Heikueinen & Mathew Webster spent a session at Seven Gates and the first cast at 12.30 am paid off for Sammy when he landed a 61cm 3.9 Kg or 8.6 lbs on the old scale. Needless to say Sammy was as giddy as a school boy when talking about fight the his monster brown put up.Sammy was using Fluro Red Power Bait nuggets on a running sinker set up with a scrubworm chaser.The brown made the other 5 fish landed look small and has kept the boys keen on seven gates being such a great spot. Here is Sammy & Mathew with the monster brown. The Snowy Mountains minnows, Pm7, Pm8. Rapalas in floating and broken back are doing well in the following series,F7,F5, F9 in Rainbow trout, Brown trout. 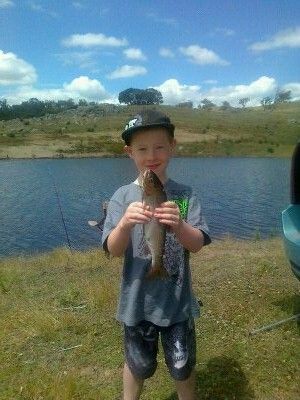 The father son duo of Mathew & Daniel Conway came all the way from WA to fish Buckenderra and it paid off for Daniel.Here he is with his first Rainbow Trout. They landed five fish for the afternoon and are back out on the water seeking more trout for the scrapbook.